We know you are committed to your pet, yet, even when you care, it’s easy to misinterpret signs your pet shows as normal or harmless. Unfortunately, delaying treatment may result in severe disease or even death in many common pet emergencies. 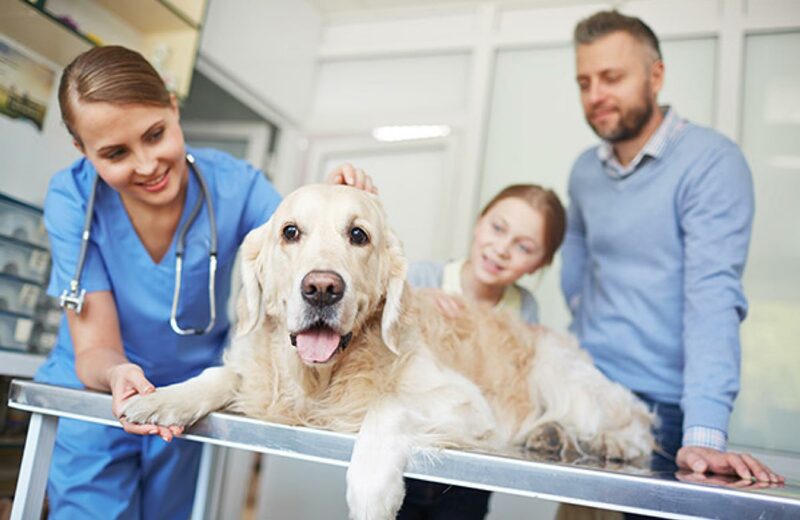 Understanding and keeping a list of the most common emergencies that require a veterinarian’s attention will help keep your pet healthy for a long time. An animal that cannot be roused from sleep may have a serious condition and a veterinarian needs to be contacted immediately. Your veterinarian will evaluate the animal and identify the reason your pet lost consciousness. Aside from a lot of cleanup, many people view diarrhea and vomiting as harmless common signs that have no real danger. Unfortunately, there are many conditions that will cause death if left without treatment. It’s important to find out why the animal is having this reaction and treatment should be started to avoid severe dehydration. The history of what your pet has eaten will be incredibly important to provide appropriate treatment, especially if it is possible your pet was exposed to harmful toxins. The information you can provide about your pet’s most recent activities will help the vet find out what’s wrong and how to fix it. Although first aid at home is important when the accident initially occurs, if bleeding is severe or lasts more than five minutes, it must be checked by a vet. Fur may easily hide a bigger problem, or your pet might need stitches to heal quickly and without infection. The laceration could be deeper than it appears and there could be internal bleeding that needs surgery. Continued bleeding may if be due to a lack of platelets or decreased clotting function. Air is a vital part of life and without it, your pet may quickly die. It is a great plan to learn animal CPR before you ever need to use it and its never a good idea to try to remove items from the airway unless you can easily grab them without pushing them deeper inside your pet’s windpipe. If your pet is not breathing, start CPR and while you are doing so, have someone drive you and your pet to the nearest animal clinic to have a veterinary professional perform life saving measures. Even if your pet starts breathing again, make sure your veterinarian performs an exam and necessary diagnostics to identify the initial cause and makes sure no organs were damaged during the lack of oxygen. The appearance of blood in vomit, feces, nose, saliva, mouth, or ears is a severe abnormality that needs to be corrected. Seek veterinary care to determine why this is happening and treatment to resolve the problem. An animal that has pain in urination or defecation, or can do neither, may be in danger and it’s important to find out why. Although this doesn’t seem to be a big problem, the deeper problem may be dangerous and catching it early could save your pet’s life. Your pet’s vision is important and even minor injuries could result in very painful processes that may lead to blindness. Eye problems may also be the first sign of brain damage that could be life threatening so any changes in your pet’s eyes should never be ignored. Asking a vet for help will save your pet further harm. Items such as antifreeze, multivitamins, chocolate, pest poison, and many more are very dangerous to pets, even though humans use them on a daily basis. Unfortunately, many animals will also eat them willingly and even find them tasty. It’s a great idea to learn what items are poisonous to your pet and call a veterinarian immediately if you suspect your animal has ingested any toxic substance. During or after a seizure, a vet should assess the situation, and recommend more tests to find out how to best help the animal. In some cases, the seizures may be caused by something completely treatable, other times anticonvulsants will be used to prevent further dangerous seizures. Many animals will have seizures while you are away from home and you may only suspect it occurred and see signs of weakness, dilated pupils or lethargy. Any of these problems may still indicate a major problem that needs a veterinarian’s care. Your dog or cat needs every opportunity to be free of pain and speed of healing. This is why it’s never a good idea to allow an animal to “heal” when he or she displays limb issues. Many side effects can occur if a broken bone or musculoskeletal abnormality goes untreated, causing unnecessary pain later in life. Avoid these issues by taking the animal to the veterinarian, allowing your pet to live a happier, healthier, and longer life. Many animals mask signs of pain for as long as possible, so when they are exhibiting signs of pain like limping, vocalizations, or panting, it is likely the disease causing the pain in the first place has progressed to a chronic and more dangerous situation. In animals, we can appreciate mood changes or increased anxiety as another sign of pain and your normally friendly dog may suddenly try to bite you or start inappropriately eliminating in the house. If you see signs of pain or strange behavior changes, call a veterinarian right away to have your pet evaluated to diagnose any possible cause for the changes. Because many animals mask their pain during a veterinary visit, any areas of pain that you notice at home may be extremely helpful to gain insight into problems your veterinarian will diagnose.